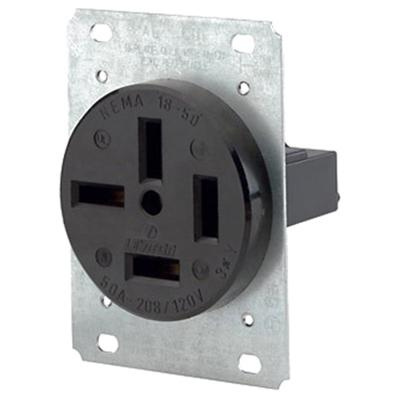 Leviton Decora® 4-Pole 4-Wire Extra heavy-duty straight blade receptacle in black color, has current rating of 50-Amps and 3-Phase Y voltage rating of 120/208-Volts. This 3-Phase receptacle has dielectric voltage rating of 2000-Volts and power rating of 7-1/2 hp. Industrial grade receptacle features nylon face and body. It measures 3.75-Inch x 2.75-Inch. This receptacle accommodates wire of size up to 4-AWG. Receptacle has brass-hot, green-ground, white neutral color-coded terminals for easy user identification. It has galvanized steel strap for easy mounting. Double-wipe brass contacts offer optimal signal conductivity. Receptacle is perfect for factories, schools, hospitals and commercial office buildings. It withstands temperature rating of -40 to 60 deg C. It is suitable for use in factories, schools, hospitals and commercial office buildings. Flush mount receptacle has NEMA 18-50R configuration for added safety. It has V-2 per UL94 flammability rating to withstand hazardous environmental conditions. Receptacle is UL listed, NOM certified and meets ANSI standards.